The numbers of European birdwatchers that visit the Madeiran archipelago have increased dramatically in recent years. The reasons for this are many and varied. The main reason to visit Madeira has always been the endemic bird species and races. The second reason, and probably the most interesting one, is the excellent opportunity for watching seabirds and cetaceans from the mainland or boat crossings between the nearby islands. The hot spot Porto Moniz, which is the number one site for sea watching, is certainly a good reason for many birders to visit Madeira. Add to this a nocturnal trip to Pico do Areeiro, listening for the endemic Zino's Petrel under a starry sky and your visit will stay in your memory for a long time afterwards. And remember, Madeira offers easy birding and is a perfect destination for a combined holiday with your partner or family. Every birding site or boat trip has something for everyone! Blue Rock Trush  1st for Madeira! 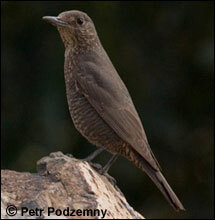 Ring Ouzel  2nd for Madeira!